Phosphorylation site-specific antibody selective for the phosphorylated form of human tau containing a phosphate on serine 409. Synthetic peptide corresponding to Human Tau. Synthetic peptide (Human) derived from a region of human tau that contains serine 409. The sequence is conserved in mouse and rat. 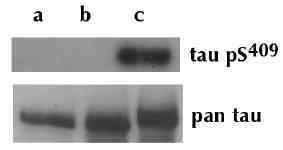 Recombinant human Tau left untreated, or treated with PKA. Purified from rabbit serum by sequential epitope-specific chromatography. The antibody has been negatively preadsorbed using a non-phosphopeptide corresponding to the site of phosphorylation to remove antibody that is reactive with non-phosphorylated tau. The final product is generated by affinity chromatography using a tau-derived peptide that is phosphorylated at serine 409. Our Abpromise guarantee covers the use of ab4861 in the following tested applications. WB 1/1000. Predicted molecular weight: 62 kDa. WB using ab4861. The peptide corresponding to Tau [pS409] blocks the antibody signal, thereby demonstrating the specificity of the antibody. Publishing research using ab4861? Please let us know so that we can cite the reference in this datasheet. There are currently no Customer reviews or Questions for ab4861.